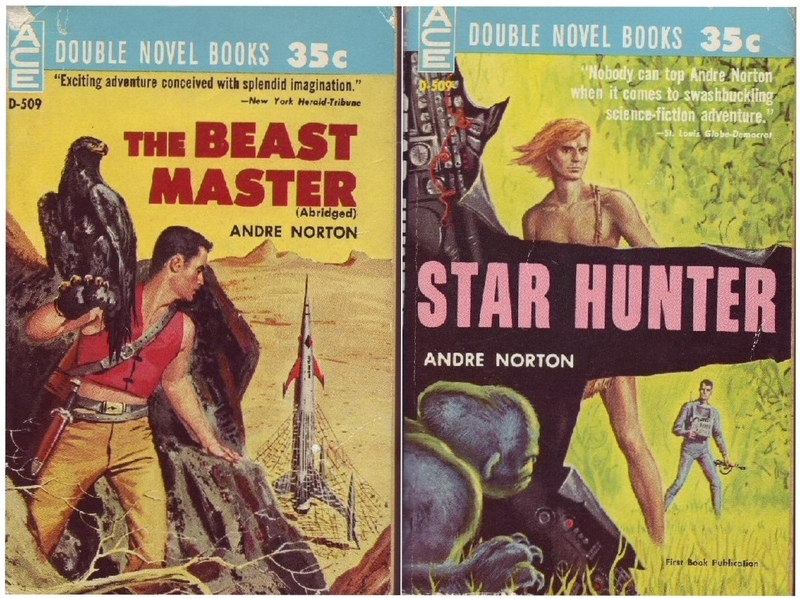 I don’t remember which Andre Norton book was the first that I read. I do know that sometimes when we moved to a new town where the library didn’t have a clearly labeled science fiction/fantasy section, I would head to the card catalog and look up Norton to find out where to start. I do remember one of her books that I read over and over: Daybreak 2250 A.D.. I believe that I first read it in fourth grade. It was a hardback copy from the school library with the original title: Star Man’s Son. I found the copy with the blue and white cover and the alternate title in a used bookstore sometime in middle school. The novel is set in the mid-23rd Century, two hundred years after a nuclear disaster has destroyed civilization. The protagonist, Fors, is the son of a Star Man, who have been scouring the earth for old technological treasures, books, and the like that they are preserving as part of a plan to eventually rebuild a civilization. Fors is a mutant with silver hair and mild psychic powers who is ostracized by the other Star Men after his father dies. He has a series of adventures with his unnaturally intelligent cat, Lyra, eventually proving himself worth of carrying the distinctive star badge of his father’s people. Th novel was originally written in 1952, and was intended for the young adult market, so the plot and setting don’t seem terribly original now. But she described Fors’s and Lyra’s world vividly enough to seize my imagination. Having a hero be a young person who is rejected by his own people for being a freak is something that most kids could related to, let alone a closeted gay nerd who loved science growing up with creationist fundamentalists. And what kid wouldn’t want to go on fantastic adventures with a kickass telepathic cat as a companion? Despite the fact that I read it so many times, the specifics of the plot never stay with me. I remember the setting, the hero, and the cat. There were various encounters with less civilized tribal cultures, but I don’t remember any specifics. I don’t even remember what discovery he made at the end to earn his place with the Star Men. But I loved that book! Then there were the pair of Norton books that were released as a double-book. These were an interesting idea: publish two different books back-to-back (one was literally upside-down compared to the other) and sell for the usual paperback price. This was one of the few I ever found where both books were by the same author. Others usually had one author I had heard of on one side, and a complete unknown on the other. This is not a scan of my copy. When I found mine for sale extra cheap at a used book store, it was missing the Beast Master cover completely, and had maybe half of the other one still intact. Someone had attempted a repair with book tape and some cardstock. I had never known what the original Beast Master cover looked like until the age of the internet. It is important to note that this book pre-dated the movie of similar name by many years. And the movie bears almost no connection to the plot of the book. I understand that Ms. Norton received a licensing fee for the movie, but I don’t know whether it was meant to be an adaptation. Anyway, Norton’s novel is about a man of Navajo descent named Hosteen Storm who has a telepathic link to certain animals. Storm and his companions end up on a colony world after leaving the military. Star Hunter, on the hand, is about a young guy who discovers he has another person’s memories and a bunch of people are out to get him. Just skimming the titles in the very long bibliography of Norton’s work on Wikipedia brings a fond smile to my face. Whether she was writing science fiction or fantasy (or the occasional historical novel), she created scores of imaginary worlds that I wanted to run away to, and gave me characters I wanted to be like. A recurring theme was the outsider who finds or makes their own niche in the world. Her stories made me believe that it didn’t matter if people called me a freak, or said I was irrelevant or unsuitable because of some arbitrary standard—what mattered was what I did with the hand fate dealt me. That was an inclusive message I desperately needed to hear growing up. Fortunately, Andre Norton was there to show me the way. 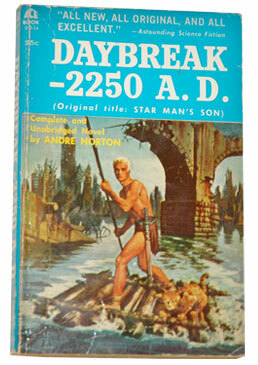 “Daybreak” is one of my contenders for first sci-fi book, since in the intervening years the memory does change on you. But it’s always on the list along with “Step to the Stars” by Lester Del Rey; “Farmer in the Sky” and “Martian Chronicles”. I remember looking for books with ‘space’ or ‘star’ in the name and for the spines that had the Winston rocket symbol or the atom. Finding old copies of these books is harder now–used bookstores are vanishing. Finding hard covers is still a thrill but few and far between. I remember “Daybreak” fascinated me–I still have a thing for post-apocalypse fiction. And the guy on the cover didn’t hurt. My mother read her Robert Heinlein and Agathe Christie books aloud to me to teach me to talk properly, so first sci fi is was before I could remember. And yeah, I really miss used bookstores.